She took a 1:3 ratio mixture of Earth's Best oatmeal cereal to milk. Loved it! Soon we'll try our hand at purees. I have my baby food maker ready to roll. 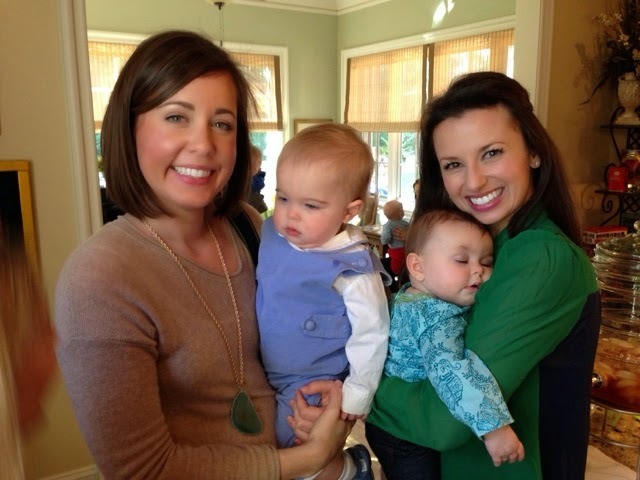 Later that afternoon, she attended a friend's first birthday party. Oh my goodness, there was a baby ball pit, and she was in LOVE with it. Hellllooooo, Santa gift! I've already added the inflatable pool and the 100-pack of balls to my Amazon list of Christmas gifts to buy. We aren't buying her a lot of gifts this year, but at $37 for this combo is a pretty good price, and especially since we can get double-duty and use the inflatable pool in the summer. She ended up starting her afternoon nap earlier than we expected, so we got her home as quickly as we could to try to keep that nap going. Sunday consisted of a lot of laundry! After some quick trips to Homegoods and Michaels, I stayed home with the babe while Ian went to the Panthers game with a buddy. Camille took short naps and I used some of that time to work on her baby album and fold clothes. The most exciting load of laundry that I did (never let me say that phrase again) was our new flannel sheets. 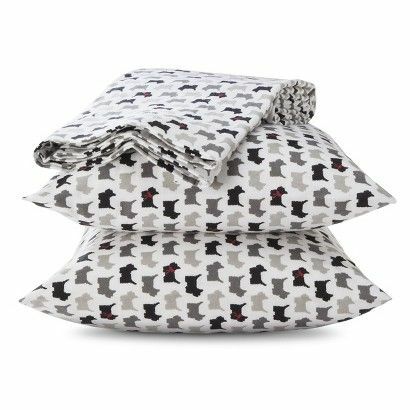 Per Elise's recommendation, I bought us some flannel sheets and could not resist the scottie dog pattern. And you can't beat $24.99 for king-sized sheets. Plus, FREE shipping now! They are now on our bed and our first time sleeping on them will be tonight. I can't wait to call it a night and snuggle up in bed with a book. That's about all that's going on here. I am excited to share my Christmas wishlist tomorrow and hope you'll link up with us for the My Favorite Things linkup ... if you missed the details, catch 'em here. she did so well! Both my kids were disgusted! LOL! We LOVE our flannel sheets! We've had them the bed since September. Let me know what you think about the Target ones, that price is great! Oh my goodness that video is so adorable! Looking forward to those moments in the future! Her reaction on the video is priceless. She just can't get enough! That ball pit is a genius idea. Oh that video is adorable. She is too cute!! BALL PIT!!!!!! Oh my gosh. Adding that to C's Xmas list. Amazing. Yay for Camille! It looks like you all had a great weekend! Both of my flannel sheet sets are from target and they are the best! I've had mine for several years- they hold up well, are warm, cozy and an unbeatable price. Might have to snag another pattern this year! Oh my goodness- she did GREAT with that food! 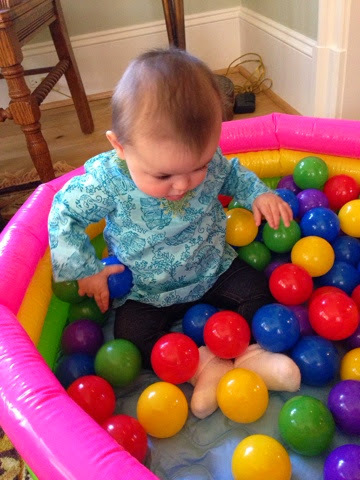 Baby ball pit is on our wish list too- we have friends that have one that's kind of meshy and "enclosed" so the kid can go nuts with the balls and it doesn't go flying all ove rthe room! Love that pool & ball set!! So fun & love that it's versatile! & you can't beat that $37 price tag!! So cute! And she loved the ball pit, that's awesome. She's getting so big! Fleece sheets are maybe my favorite part of winter...except they make it impossible to get out of bed in the morning! So cozy! Girl I jumped out of bed this morning and told my husband to take me to Target for those sheets. On our way now! Haha. Thank you! I may have to pick up some flannel sheets! How cute that she was trying to grab your hands for more! so cute! that baby ball pit is such a great idea! We've got a new heated mattress pad on the way to our doorstep! I can't hardly wait until it arrives! Camille is so sweet eating her oatmeal! Love it:) I remember when Caleb had oatmeal for the first time, and his reaction was so similar - he loved it, and was trying to eat the spoon as well! Definitely going to need an update on those sheets. Just $25 for a king? Amazing. If they are as cozy as they look, I'll be tempted to buy them in every pattern!!! We have one set and LOVE them, but they are getting pretty old and worn out so it may be time to update! Love the holiday sheets! We also got the scotty dog ones this year and I can't wait to put them on! Enjoy. Oh my word i feel like she will be practically feeding herself by tomorrow! haha too too cute! I just put brand new flannels on the bed last week and COULD NOT be happier! NEVER want to leave bed! Oh my goodness! She was so ready for that food. :) That is the sweetest little video! Sounds like y'all had a great weekend. Purees are so much fun, too. We used a food processor, and baby girl loved the foods! I also just used an ice tray to portion out the food, too. Easy peasy! She would eat two cubes of whatever we made after each milk session. ;) Happy eating, sweet C! omg that video is SOOOO cute!!! love that ball pit! oh my goodness, checking out those sheets now. So sweet!! She loved it. And her reaching out for it was just the cutest!! Glad y'all had a great weekend! I can check if the ornaments are cheaper here for you, if you want... I mean I do live in the land from which they come! 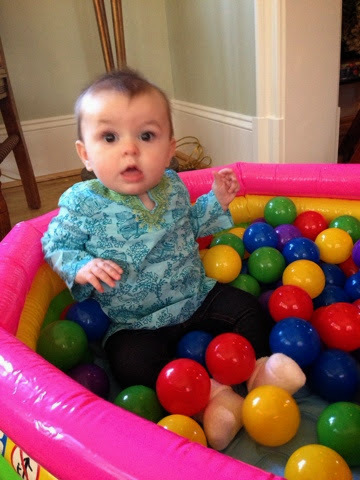 Baby ball pit -- fabulous idea! I just ordered the set you suggested for my granddaughter for Christmas -- it's the perfect gift! I think she'll enjoy it a lot more than the U Fund we're setting up for her...at least for the time being! The video was too sweet! I am loving those Holiday flannel sheets and at only $24.99?? SOLD! !